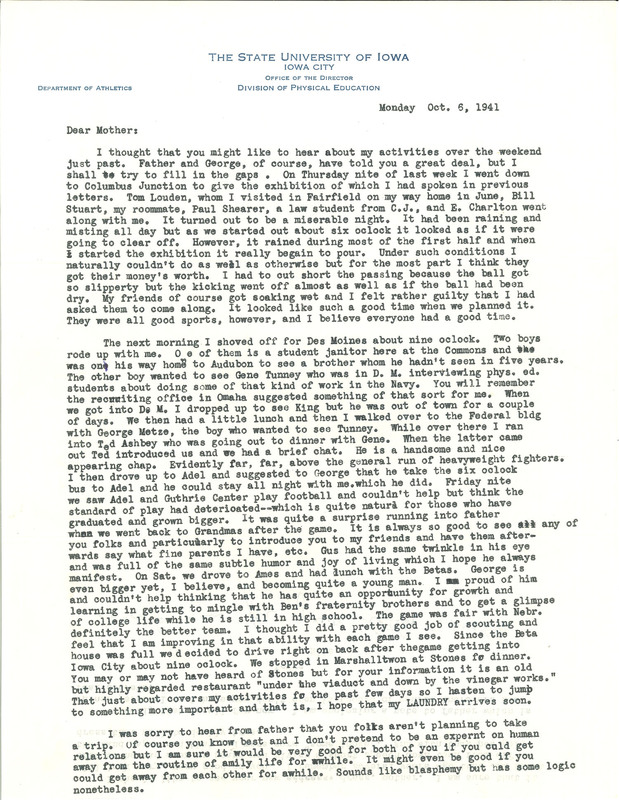 Monday Oct. 6, 1941 Dear Mother: I thought that you might like to hear about my activities over the weekend just past. Father and George, of course, have told you a great deal, but I shall try to fill in the gaps . On Thursday nite of last week I went down to Columbus Junction to give the exhibition of which I had spoken in previous letters. Tom Louden, whom I visited in Fairfield on my way home in June, Bill Stuart, my roommate, Paul Shearer, a law student from C.J., and E. Charlton went along with me. It turned out to be a miserable night. It had been raining and misting all day but as we started out about six oclock it looked as if it were going to clear off. However, it rained during most of the first half and when s started the exhibition it really begain to pour. Under such conditions I naturally couldn't do as well as otherwise but for the most part I think they got their money's worth. I had to out short the passing because the ball got so slipperty but the kicking went off almost as well as if the ball had been dry. By friends of course got soaking wet and I felt rather guilty that I had asked them to come along. It looked like such a good time when we planned it. They were all good sports, however, and I believe everyone had a good time. The next morning I shoved off for Des Moines about nine oclock, Two boys rode up with me. One a of them is a student janitor here at the Commons and was on his way home to Audubon to see a brother whom he hadn't seen in five years. The other boy wanted to see Gene Tunney who was in D. M, interviewing phys. ed. students about doing some of that kind of work in the Navy, You will remember the recruiting office in Omaha suggested something of that sort for me. When we got into De M. I dropped up to see King but he was out of town for a couple of days. We then had a little lunch and then I walked over to the Federal bldg with George Metze, the boy who wanted to see Tunney. While over there I ran into Ted Ashbey who was going out to dinner with Gene. When the latter came out Ted introduced us and we had a brief chat. He is a handsome and nice appearing chap. Evidently far, far, above the general run of heavyweight fighters. I then drove up to Adel and suggested to George that he take the six oclock bus to Adel and he could stay all night with me.which he did. Friday nite we saw Adel and Guthrie Center play football and couldn't help but think the standard of play had deterioated--which is quite natural for those who have graduated and grown bigger. It was quite a surprise running into father when we went back to Grandmas after the game. It is always so good to see any of you folks and particularly to introduce you to my friends and have them afterwards say what fine parents I have, etc. Gus had the same twinkle in his eye and was full of the same subtle humor and joy of living which I hope he always manifest. On Sat. we drove to Ames and had lunch with the Betas. George is even bigger yet, I believe, and becoming quite a young man. I am proud of him and couldn't help thinking that he has quite an opportunity for growth and learning in getting to mingle with Ben's fraternity brothers and to get a glimpse of college life while he is still in high school. The game was fair with Nebr. definitely the better team. I thought I did a pretty good job of scouting and feel that I am improving in that ability with each game I see. Since the Beta house was full we d ecided to drive right on back after thegame getting into Iowa City about nine oclock. We stopped in Marshalltwon at Stones fo dinner. You may or may not have heard of Stones but for your information it is an old but highly regarded restaurant "under the viaduct and down by the vinegar works." That just about covers my activities fo the past few days so I hasten to jump to something more important and that is, I hope that my LAUNDRY arrives soon. I was sorry to hear from father that you folks aren't planning to take a trip. Of course you know best and I don't pretend to be an expernt on human relations but I am sure it would be very good for both of you if you culd get away from the routine of amily life for awhile. It might even be good if you could get away from each other for awhile. Sounds like blasphemy but has some logic nonetheless.